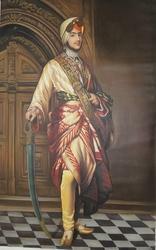 Pioneers in the industry, we are offering an excellent range of Maharaja Portrait Painting. This painting is designed in compliance with set guidelines by our highly skilled professionals by using best material and leading techniques. Offered painting is coordinated well with any type of interior decor and is available in various standard and customized shapes and designs. 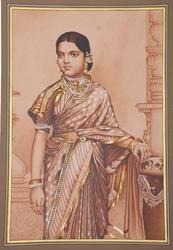 As well, this painting is perfect to suit the luxurious home decor. 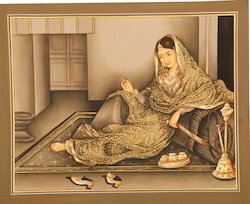 Mughal lady smoking huqa symbolize the royalty of mughal era. Artists.l.soni has created this art work by water n stone colour on handmade paper sheet. 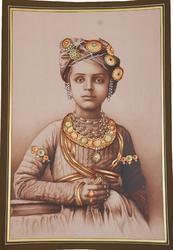 we are having specialize in portrait painting since very long time, we are third generation artists ,our grand parents worked as portrait artist with maharajas jaipur, jodhpur . 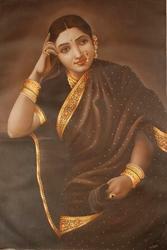 we are having specialize in portrait paintings any kind of portrait like Late Grand Parents , Young Couples , Kids etc. takes normally 20 days in customization depends upon the size respectively. Looking for Portrait Painting ?